What is all the BUZZ about - all about our honey bees, why they are important, what they do and how they do what they do. Enjoy! Bees are very important to our food chain. Support them, plant a flowering plant or tree in your garden. Learn about them and help your local beekeepers by buying raw local honey. You can learn more on our Beekeeping YouTube Channel or our Mahakobees Blog. Click to go there. Thank you. DRONE eviction - Chewing drone wings OFF! DRONE sentenced to death by Drone Eviction. Unique bee behavior. See the worker bee chew on her brothers wings and evict him from the HIVE. http://ift.tt/1opiWHi. Our blog http://ift.tt/1z3tL60 has many interesting beekeeping videos and articles. Come and check it out and help our beekeepers save our bees which are currently under great threat from pesticides, pests, viruses and colony collapse disorder! Once thee bees go, we will struggle to feed ourselves. This video was a lucky take, as it shows a closeup of the bee hive entrance as the worker bee evicts her brother the drone from their colony. It is winter here, and the bees are still evicting their drones mercilessly. As the queen bee reduces her egg laying activities, the worker bees forcefully push the drones out of the bee hive. The male drones don’t have a stinger and as such, are powerless against the worker bees (their loving sisters) even though they are 30 percent larger in mass. Only a few will remain in the hive as a precautionary backup plan should the queen fail to continue to lay eggs for any reason. The worker bees would kick off the supersedure process and immediately begin nursing an egg into a new queen. Several of them at a time in fact and the first one would typically kill the others before they hatch by stinging the queen cell with her stinger. Only the queen can sting repeatedly without loosing her venom sack. The queen stinger lacks the return hooks and is more like a wasp stinger. the Queen stings rarely though otherwise. So, as this video shows, beekeeping is a very interesting hobby. Should you be considering joining the beekeeping industry, come and visit our blog for more information as to what beekeeping entails, what to expect, helpful information on how and why to get started and visit our store for useful books, tools of the trade, even the hives and all things related to beekeeping - http://ift.tt/1yAK5Iy. Beekeeping at http://www.mahakobees.com. Visit our YouTube channel for great beekeeping videos. 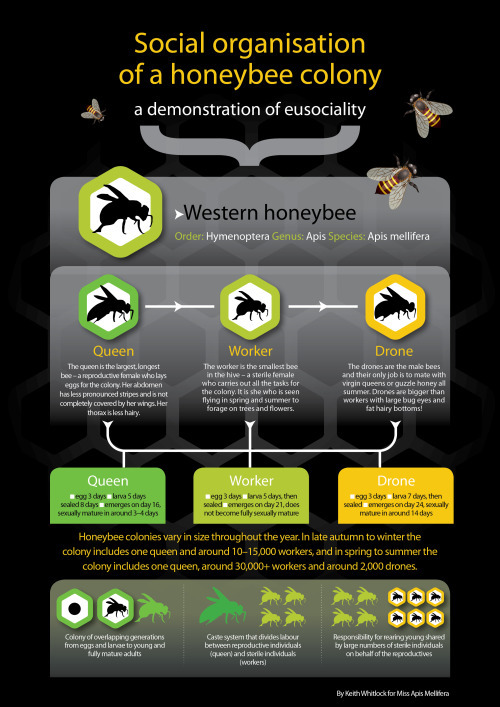 The above is a great infopic explaining the organisation of a honeybee colony. 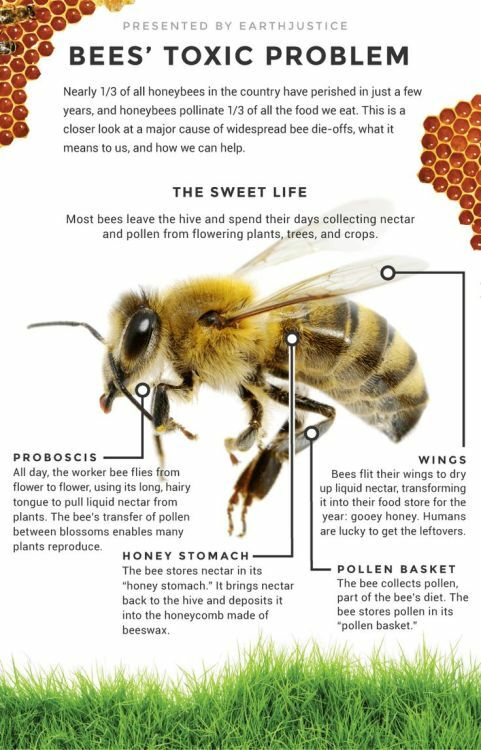 Learn about bees, they are a vital part of our food chain! After a banana tree trunk fruits, it no longer produces any fruit, so it is important to cut it down so the tree can use its energy for new shoots and subsequent fruit. As you can see in the video, we cut the banana tree down, strip the leaves, and place the trunk on grass. Then we use the machete to cut slices off the trunk. those we then cut in halves or smaller pieces. The banana tree consists of cardboard like layers, much like onion rings, but each ring is a dense cardboard like structure, making it an excellent heat and water insulator. It is also far superior to any hay or grass clippings as it lasts much longer in your garden. We place these under and around our trees and the veggie gardens to prevent water evaporation and reduce the growth penetration of weeds. Give it a go. Its fast, easy, and free saving you money and you no longer need to go to the tip either. A win no matter how you look at it. So if you have a green thumb, have a banana tree and own a machete, give the DIY Mulch from banana trees a go. If you enjoy our videos and we have helped you or entertained you in the very least, please share, subscribe and hit the thumbs up button. We appreciate it. Nuc box beehive with free form honeycomb built by our super productive bees. Get the nuc box from our beekeeping supplies store and decorate it to your liking too. Post a pic! NEW VIDEO - Custom Made Nuc box BEEHIVE decorated by bees themselves. http://www.mahakobees.com/store.html looks briefly at our custom made beekeeping nuc hive which our hyperactive and super productive honey bees filled to the brim with burr comb and golden honey. We also show you a close up of our handmade wooden hive entrance reducer which assists new bee colony splits in protecting their hive entrance until they grow in numbers. So when would a budding beekeeper use such a small beehive, or a nucleus beehive? These hives are typically used for splitting your colonies or to relocate a small swarm of bees if you are lucky enough to find one. The hive itself can come in many forms, shapes and sizes. Standard width is 4 or 5 Langstroth style full depth frames and the hive body itself is usually made out of wood, much like a normal full size brood chamber would be with an entrance and a top cover. There are also polystyrene and cardboard versions available in various local beekeeping supplies outlets, but these are used for transportation generally. The nucs can also be user to raise queens if you have lots of beehives and want to save money on re-queening. Once you order one (or better yet, make one), it is usually flat packed like other timber beehives and needs to be assembled. It functions exactly the same way as a normal full size hive would, but the space is smaller and most importantly, the hive entrance is much smaller in width, which enables the new guard honey bees to protect the colony from being robbed, attacked or invaded by pests such as the wax moth and small hive beetles. We add an additional adjustable hive entrance reducer which further restricts the opening because the bees in their first few days after migration only have a few guard bees available for hive protection, so the reducer helps by reducing the opening further minimizing their exposure to external threat. Once the colony fills up all the frames and you have a healthy fertilized and laying queen, you can either migrate them to a full hive or add a second level to the nuc. You will need to make that decision depending on where you live and how strong your bee colony is as well as other factors such as the season you are in, availability of food and flowering plants, and availability of your beekeeping equipment. Also, a big thank you goes to Kevin McLeod for providing his royalty free music "Sidewalk Shade". We appreciate your kind contribution - (incompetech.com). Click the image to see the cute hive this bee is protecting. NEW BEEKEEPING VIDEO. Review of a BEE SAFE Diatomaceous Earth Small Hive Beetle trap, which is a bee safe non-toxic Physical Insecticide. Especially the super fine Absorbacide - http://amzn.to/10YbxVA - ultra fine dust less than 15 microns in size - which acts like razor blades to the small hive beetles outer casing. Once the hive beetles outer wax coating is compromised, it dries out and dies quickly. As it is a physical insecticide, the beetles will not build up a resistance to it. Diatamaceous Earth DE is a relatively safe insecticide to use for the control of the little pest hive beetles, however, in larger amounts, it can also kill your bees. So use it wisely and carefully. Still, the crystalline silica shards are non toxic, which to us is a whole lot more acceptable for use in our apiary than their chemical based counter parts. DE does not present any health hazards and has been approved by CSIRO for organic food producers. Other alternatives include oil based traps, such as the AJ Beetle Eater, or Beetle Blaster http://amzn.to/10YbCJ0, trap or similar under hive IPK Screened Bottom Board & Small Hive Beetle Traps http://amzn.to/1y8lMAI that also work well. These contain vinegar and oil in a dark plastic trap which has small openings on the top and as the bees chase the beetles around the hive, the beetle enters the trap and can no longer escape. Fantastic traps, but a little too messy. Oil often spills throughout the hive, and need to be replaced, emptied or replaced. Not the most pleasant task a beekeeper has to do during a hive inspection. So, we are trialing this neat version of Diatamaceous Earth Small Hive Beetle Trap. Costs around a dollar per unit, is reusable, kills beetles over a long period of time if kept DE remains dry, is bee friendly and easy to handle even when propolized by the bees. Beekeepers can prepare the traps away from the beehive, and simply place them on top of their frames under the top cover for easy access and manipulation. There are many great ways beekeepers deal with hive beetles and their control methods will vary widely. Similar traps can be homemade using a CD cover, a politicians sign, or any other similarly shaped containers. Let us know in the comments section below what methods you may have used or continue to use, especially if they work well. We’d love to hear from you! Hope you can join us next time, and please subscribe, share and/or give us thumbs up if you have found our videos useful. We and the bees very much appreciate your support. Another gorgeous GLASS HONEY JAR. Unique design, perfect gift for a HONEY CONNOISSEUR. Isn’t this a unique and modern glass jar? A perfect way of packaging raw honey - modern display glass honey jar. 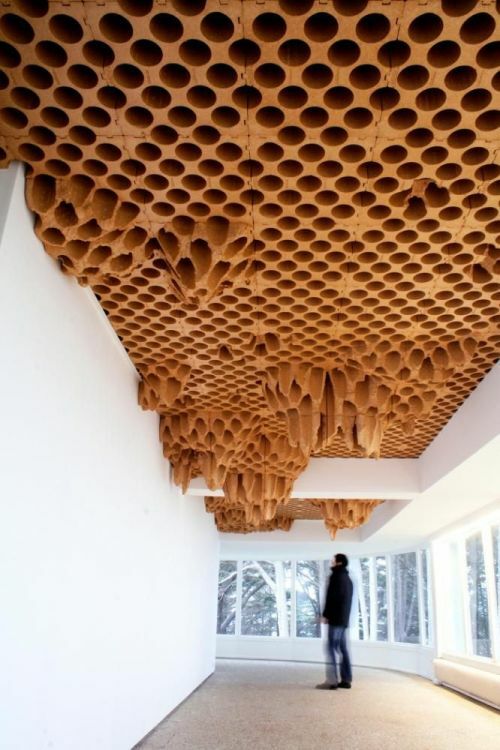 Interesting beeswax foundation hexagonal honeycomb bee artwork, made entirely from cardboard boxes - indoor beehive. Easy, cheap, and certainly unique. Might be a great little school project for a library perhaps? Our sample http://ift.tt/1opiWHi beeswax bars. Something different to your typical bees wax 1 ounce bars. Beeswax can be used in many applications such as cosmetics, wood and leather treatment, water proofing, lubricant, candle making, lip balms, mustache creams, cheese preservation, oceanic spills cleanup, egg painting, art work, crayons, bullets, jewlery, glass etching, ear plugs, ear candling, dental floss, blacksmithing, stain removal, rust prevention, used as a thickenner pr emulsifier, in adhesives, grafting plants, fly fishing, optical lense production, moulds, snow skeing and snowboarding, surfing, wood filler, sewing machines, waterproof matches, fire fuel, and many many more. Let us know how you use beeswax? Interested in beekeeping? Come and visit our MAHAKOBEES beekeeping Blog to learn more: http://ift.tt/1z3tL60. A beautiful design of a beehive - etsy custom beehive. Hardwood for long life. Just beautiful. HONEYCOMB shop front. Very nice design. 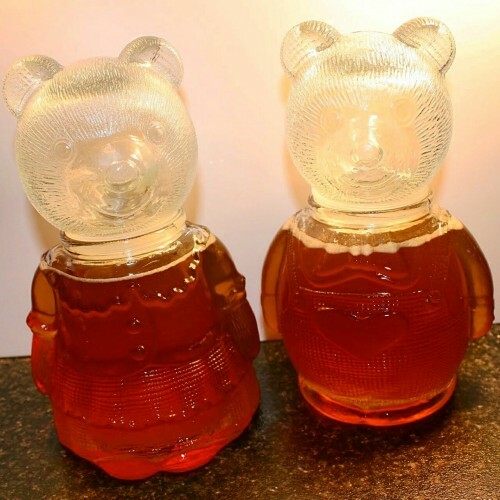 NEW RAW HONEY glass honey bear teddy jars. BOY and GIRL honey jars. Beautiful glass #honey bear 250gram jars we found and are trialling - cost is $3 each (jar only). What do you think? Kids should love these no? What are your thoughts? Is $3 too much? Would you pay this much to put a smile on your child’s face? We did, and it was worth every penny! Bee Labor or Industrial Product? Beekeeping supplies offer many options for hand protection against bee stings. Leather beekeepers gloves are one of the most popular, but often bee keepers choose to use rubber gloves, work gloves, or work leather gloves. These don't offer a new beekeeper enough protection whilst they build up confidence looking after their beehives and bee colonies. Beekeeping supply stores usually have two or three options. We look at these in the video but also look at some other, much cheaper options that many use. We prefer to handle our bees without beekeeping gloves all together, but there are times that you simply need to put them on for protection. If the weather is unfavorable, or the bees are agitated in the beehive for other reasons, you are best advised to put the gloves to be on the safe side. Sadly, when wearing leather beekeeping gloves, the beekeeper immediately looses much of their finger control and many more bees usually die during the apiary visit and bee hive inspections, especially if you are inspecting and manipulating all the frames. All the bee keeper can do, is take extra care to minimize the unnecessary bee deaths. CONCERNED about bee hive colony - mites or ashes? Beekeeping experts? NEW VIDEO - ever seen this in your beehive? On your brood frames? On your bee larvae? What do you think it is? We are perplexed somewhat, as these black spots are distributed throughout the frame on all larvae, but the pollen cells are clean. The consistency and distribution of the black smears or spots is very even, that we think it is not bee smoker and ashes related. In which case, what is this? Can anyone help? We have researched the issue and cannot find anything conclusive. Please take a look at the video and let us know in the comments section or via email if you have experience with this, seen it in the past or perhaps are aware of the issue and perhaps how to treat this. The beehive that this frame was extracted from was perfectly OK. The video is taken 1 day from its extraction from the hive, so you can see ants crawling around, but they would not be the cause of these black markings. Could it bee fungus? Hopefully nothing more serious like AFB or EFB, even though these symptoms are not indicative of those. No other similar symptoms exist in the beehive itself and the queen is laying fine. The colony is very strong, possibly too strong and is getting ready to swarm as we approach spring and warmer temperatures. If there is a treatment we should investigate, please let us know. We appreciate all beekeepers opinions, feedback and advice. Especially from the experienced and expert beekeepers. Your time and input is much appreciated. Hopefully its something minor. Music composed, performed and provided by Groovey - Adam Kubát a Pavel Křivák. You can visit their website on: http://www.groovey.cz/. Also, a big thank you goes to Kevin McLeod for providing his royalty free music "Skye Cuillin". We appreciate your kind contribution - (incompetech.com). DARK SPOTS in your beeswax honey frame? Backyard beekeeper 101.
http://www.mahakobees.com/blog. The dark spots can be many things, but more often than not, it will be pollen. It is often difficult to see as the bees cap the honey with a white beeswax capping. But if you shine light through the honey frame, you will see the spots. They are perfectly normal and are very good for you. In fact, they are very good for you in many ways. Unless you are allergic to honey and pollen, you should try and eat RAW honey in your diet as it helps prevent and in many cases cure hay fever by introducing your local flora into your body, therefore reducing hay fever symptoms when local trees and plants flower. It is not advisable to give children under two years of age raw honey or pollen. Seek medical advise prior, and seek medical help immediately should your child consume raw honey and show adverse reaction to it. BUT, if the art of beekeeping interests you, the best place is to visit our http://www.mahakobees.com/blog website for many instructional and HOWTO videos. We invite you to subscribe, like, and share our content. QUEEN CELLS - original #BEESWAX made by bees vs man made PLASTIC queen cups. Visit our beekeeping blog and beekeeper supplies store at http://www.mahakobees.com/blog. We take a look at queen cells or otherwise known among #beekeepers as queen cups. 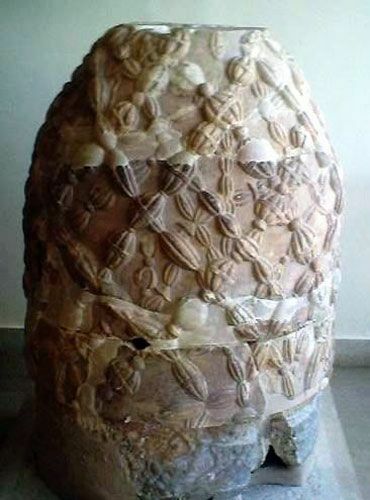 The bees frequently make their own original beeswax versions inside the #beehive, usually due to the beehive is either ready to split the colony and #swarm into a new location, or for supercedure of the aging or otherwise under performing or in the sudden absence of queen bee. In the case of a queen dying for some reason, the colony is not queen right, and as such they must quickly create several queen cups or cells and place any freshly laid eggs inside and begin feeding the select few royal jelly. The queen cell is much larger than a normal worker bee cell or in deed a drone cell. The egg and subsequent bee larvae that was destined to become just another worker bee will now be fed exclusively large amounts of the honey bee produced royal jelly, and this will trigger it to develop into a queen bee rather than the worker bee. Nonsense you say? Well... in a way, you are right. This is kind of a miracle on many levels. Not only will the egg develop into an entirely different creature physiologically, but its lifespan will also increase rather dramatically. A typical worker bee will live for about two months and perhaps longer during the winter months, whereas the queen bee can live for six or more years!!! Yes, rather impressive! And all because it was fed a different diet! That's it. No other magic. No wander many scientists are studying this amazing substance and are hoping to find a formula to this elixir of life. In any case, we look at the difference or similarities of the original honey bee made queen cell which is entirely made from beeswax to the exact specification that is consistent in all hives right around the world, and the fake, man made plastic queen cells or cups beekeepers use in larger operations to produce new queens in large quantities. Beekeeping often requires new queen bees to build up populations for honey flows and other pollination services, and in such circumstances, it is faster and financially viable for #beekeeping operators to simply purchase already fertilized queens. It saves time and increases production. What amazes us, among all the other amazing facts about the bees, their colonies, social interactions and natural instincts is their ability as a collective to monitor their colony as a complex collective and manage all their workers, drones and queen bees without any other input. Completely by instinct it seems. Unless we are missing something and cannot see the writing on the wall or listen in at the #bees frequency or dimension. Beekeeping is an eye opening hobby. We encourage you to join a beekeeping association, subscribe to our channel and click the thumbs up to help us spread the word about honey bees and their tremendous importance in our lives. Music composed, performed and provided by Groovey - Adam Kubát a Pavel Křivák. You can visit their website on: http://www.groovey.cz/. Also, a big thank you goes to Kevin McLeod for providing his royalty free music "Undaunted". We appreciate your kind contribution - (incompetech.com). HOW TO light a long lasting #bee #smoker quickly and easily in only minutes, that will smolder for hours. An essential skill for anyone starting out in the #beekeeping #hobby or beekeeping industry. We have many smokers available at our online store http://www.mahakobees.com/store.html ready for immediate shipping (mostly free in USA), so feel free to visit and get yourself a smoker or an entire backyard beekeeping starter kit if you are ready to indulge in this excellent earth saving hobby as an apiarist. A bee smoker is essential for a #beekeeper. Most beekeepers will not undertake a regular hive inspection without a well lit bee smoker. The cold smoke masks the pheromones of the guard bees and alerts the bees that a fire may be approaching. This helps the bee keeper because the bees gorge on honey, fill their stomachs in preparation for an urgent migration if necessary. Once the bee stomach is full, they are less likely to fly around and sting the beekeeper doing the beehive inspection in their #apiary. This video describes full instructions to light a bee smoker, items needed, and the step by step guide to a successfully smoldering beekeepers smoker. The steps outline using hay and wood filings, but also a layer of insulating cardboard (or ideally non-toxic paper as correctly noted by Honey-B-guys in the comments below), which protects the bee smoker itself, insulates the heat, and certainly maintains the smoldering coals a lot longer than usual. Make sure you pack the smoker well for a long and easily reinvigorated smoke with just a few puffs of the #bellows. We trust you will find this beekeeping 101 howto video and if you do, we invite you to subscribe, share, and thumbs up below. We very much appreciate it. DRONE sentenced to death by eviction. Unique bee behavior. See the worker bee chew on her brothers wings and evict him from the HIVE. http://www.mahakobees.com. Our blog http://www.mahakobees.com/blog has many interesting beekeeping videos and articles. Come and check it out and help our beekeepers save our bees which are currently under great threat from pesticides, pests, viruses and colony collapse disorder! Once thee bees go, we will struggle to feed ourselves. The male drones don't have a stinger and as such, are powerless against the worker bees (their loving sisters) even though they are 30 percent larger in mass. Only a few will remain in the hive as a precautionary backup plan should the queen fail to continue to lay eggs for any reason. The worker bees would kick off the supersedure process and immediately begin nursing an egg into a new queen. Several of them at a time in fact and the first one would typically kill the others before they hatch by stinging the queen cell with her stinger. Only the queen can sting repeatedly without loosing her venom sack. The queen stinger lacks the return hooks and is more like a wasp stinger. the Queen stings rarely though otherwise. So, as this video shows, beekeeping is a very interesting hobby. Should you be considering joining the beekeeping industry, come and visit our blog for more information as to what beekeeping entails, what to expect, helpful information on how and why to get started and visit our store for useful beekeeping books, beekeepers tools of the trade, even the hives and all things related to beekeeping - http://www.mahakobees.com/store.html.